Automotive Shopping Cart & Website Design Services Proven to Work! Looking for an automotive parts website design that not only looks amazing, but performs beautifully and generates sales with an online automotive shopping cart? Web Design Solutions is your one stop shop for aftermarket auto parts website design, development and support. With over ten years of experience, we have all the knowledge that you are looking for in an automotive web design company. Allow your customers to shop by category, Year Make Model lookup or both! Start here to get your Free Quote for an Automotive eCommerce website with Year Make Model! With your new auto parts website you will get one-on-one attention from our knowledgeable design and project management staff to ensure that your new website not only gets designed flawlessly, but also gets complete and starts generating revenue in a timely manner. 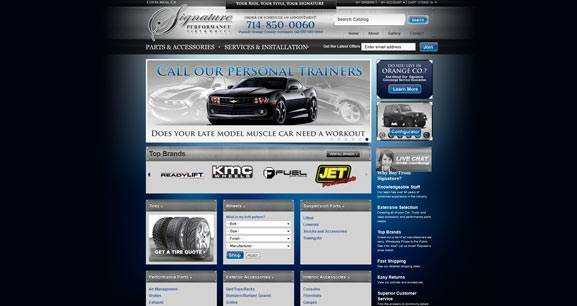 Our goal is to provide professional automotive web designs at an affordable price. You might be wondering, Why is the design of my new automotive aftermarket parts website so important? The design is the interface that your customers will navigate through to purchase products from you. Every inch of your design can impact the success of your new site, even the efficiency of the online automotive shopping cart featured on your site! So would you want to take to new business with no auto parts experience? Absolutely not! Web Design Solutions can give you our years of tested and tried experience to help make your new auto website successful and profitable. 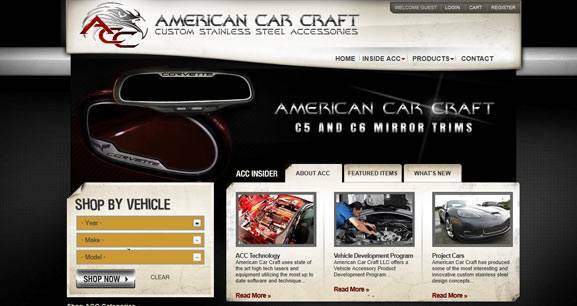 How Does Website Design Effect Automotive Online Sales? This experience has given us the exclusive knowledge of how to complete an automotive website design that not only keeps customers longer, lowering bounce rate, but also increases conversions! Unlike many design companies, we first focus on the strategic information architecture of your auto parts site. Creating the form and function of the site prior to design, allows us to ensure that your site not only looks good, but it sells auto parts online! The next step of our process is to churn out a high quality automotive web design that will just blow your competition away! Your feedback and ideas are welcomed in this process, we are here to interpret your desires and create a money making website to help you grow your automotive parts business. Our car parts websites are designed by one of our expert website designers in our San Diego office. We do not outsource any of our automotive design or development, ever. Once your new parts website is designed and built you will have access to Web Shop Manager (WSM), which is our content management system. WSM makes it so easy for you to control the site on your own or with our help with no hidden fees. Call us & get personal attention!